Back in late January of 2009, Parker had been getting sporadic severe headaches followed with uncontrollable vomiting. The vomiting would end and Parker would be back to his normal self. But, it was happening more frequently and Parker’s left eye appeared to be moving inward. On Friday, February 27, 2009, Parker had a spell unlike any before. He was rushed to Round Rock Hospital. It was unthinkable . . . Parker had a brain tumor. He was immediately transported to Dell Children’s Hospital. On Monday, March 2, 2009, neurosurgeons, Dr. George and Dr. Lee successfully removed 100% of, what was, a malignant brain tumor the size of a golf ball. It was Medulloblastoma (Stage 1). It had not spread to his spine. Over the next couple of days, Parker was experiencing fluid buildup in the 4th ventricle. On Thursday, March 5, 2009, Parker underwent surgery to permanently install a ventricular shunt to continually drain the fluid. It was a success- the swelling had gone down drastically. He was still in pain and very wobbly, but expected to be out of ICU. Everything was looking positive. March 6, 2009. We learned a bit more yesterday about Medulloblastoma, the treatment, how long it would last and what would be involved. Parker would undergo radiation treatments Monday through Friday for 6 weeks. Chemo would start once a week through the radiation. Parker would be off radiation/chemo for one full month then the heavy chemo would start for the remainder of the 55 weeks. March 11, 2009, Parker has his port installed and a spinal tap will follow next Wednesday. Physical therapy starts in a week or so. Parker struggles with balance but keeps walking whenever he can. Understandably Parker is terribly frustrated that he can’t do the normal things he used to and play the games he loved before all of this happened. Parker, his mother and rest of his family, are taking it day by day. That’s all they can do. March 13, 2009, Parker had pretty severe neck and stomach pain the last couple of days. His doctor assured us it is normal. The nerves and muscles are trying to “go back to normal” which can cause spasms, cramps and burning. Otherwise, Parker was chipper today. Lots of smiles, he sat up alot and worked in his workbooks. No tears! He’s a trooper. Parker’s Mom said. “I don’t know if I am tricking my self or not but I really believe every day when I look into his eyes, they are getting better and his walking is a teensy bit more straight” . . . “he continues to amaze us every day how strong he really is and how much stronger he is going to become after all of this”. April 8, 2009 Parker starts his radiation treatment. The last couple of days have been adjusting to the early radiation schedule, getting to know the staff and communicating Parker’s likes and dislikes. They are so supportive and have gone out of their way to do anything and everything to make Parker as comfortable as he can be while we are there. There will be 30 days of radiation treatment. The first day Parker had vomited. The nurses believed it was probably from the gas they were giving him. Therefore, we opted to keep the I.V. in his port throughout each week so no gas would be necessary. So far, so good. The vomiting had stopped. Parker’s Mom would say . . . “I still am astonished every day how tough Parker has become. I am so proud of him. He already knows the “lingo” from doctors and nurses and talks like he has been doing this for years. He has always said he wanted to be a doctor someday and I think this experience will hopefully drive him towards wanting to help other people/children just like they are helping him”. July 10, 2009 8:45am, A small spot was discovered at the location of the original tumor. The spot could be cartilage from the surgery, something caused by radiation or, it could be another tumor. It isn’t possible to conceive of the alternatives this time . . . it is simply unthinkable. We have to take it one day at a time. Parker’s mom would say “for now, it will be life as usual”. Parker and his mother would participate in a group at Dell Children’s through the month of July. Parker would enjoy meeting and playing with new kids like himself. 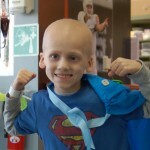 His mother would enjoy the company of other parents of children battling childhood cancer. August 13, 2010, Parker’s MRI results would show NO SIGNS OF CANCER! Parker would graduate from 3 month scans to 6 month scans and Parker would celebrate his one year anniversary since treatment was concluded. So, here are Parker’s stats…5 surgeries, 30 days of radiation, 9 rounds of chemo, 10 blood transfusions, 9 MRI’s, 1 pet scan, 4 cat scans, 43 times under anesthesia, 11 hospital stays, 100 physical therapy appointments, innumerable needle pokes and hundreds of clinic visits. Please continue to keep Parker in your prayers.